In this tutorial, you build a Universal Windows Platform (UWP) application that performs basic data access against a local SQLite database using Entity Framework Core. Windows 10 Fall Creators Update (10.0; Build 16299) or later. Visual Studio 2017 version 15.7 or later with the Universal Windows Platform Development workload. .NET Core 2.1 SDK or later or later. This tutorial uses Entity Framework Core migrations commands to create and update the schema of the database. These commands don't work directly with UWP projects. For this reason, the application's data model is placed in a shared library project, and a separate .NET Core console application is used to run the commands. From the left menu select Installed > Visual C# > .NET Standard. Select the Class Library (.NET Standard) template. To use EF Core, install the package for the database provider(s) you want to target. This tutorial uses SQLite. For a list of available providers see Database Providers. Tools > NuGet Package Manager > Package Manager Console. Make sure that the library project Blogging.Model is selected as the Default Project in the Package Manager Console. Now it's time to define the DbContext and entity classes that make up the model. In Solution Explorer, right-click the solution, and then choose Add > New Project. From the left menu select Installed > Visual C# > .NET Core. Select the Console App (.NET Core) project template. Name the project Blogging.Migrations.Startup, and click OK.
Add a project reference from the Blogging.Migrations.Startup project to the Blogging.Model project. To enable the EF Core migration commands in the Package Manager Console, install the EF Core tools package in the console application. Create the initial migration, specifying the console application as the startup project. This command scaffolds a migration that creates the initial set of database tables for your data model. From the left menu select Installed > Visual C# > Windows Universal. Select the Blank App (Universal Windows) project template. Set the target and minimum versions to at least Windows 10 Fall Creators Update (10.0; build 16299.0). Previous versions of Windows 10 do not support .NET Standard 2.0, which is required by Entity Framework Core. Since you want the database to be created on the device that the app runs on, add code to apply any pending migrations to the local database on application startup. The first time that the app runs, this will take care of creating the local database. Add a project reference from the Blogging.UWP project to the Blogging.Model project. Add the highlighted code to apply any pending migrations. If you change your model, use the Add-Migration command to scaffold a new migration to apply the corresponding changes to the database. Any pending migrations will be applied to the local database on each device when the application starts. You can now use EF Core to perform data access. You can now run the application to see it in action. 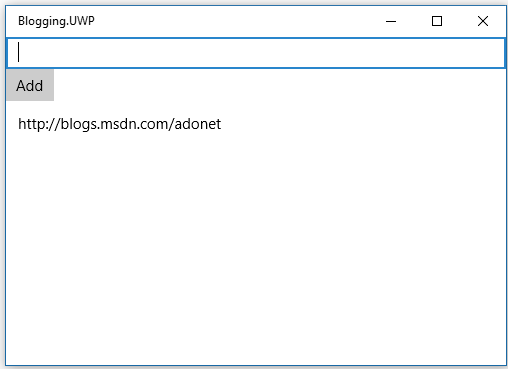 In Solution Explorer, right-click the Blogging.UWP project and then select Deploy. Set Blogging.UWP as the startup project. The app builds and runs. Tada! 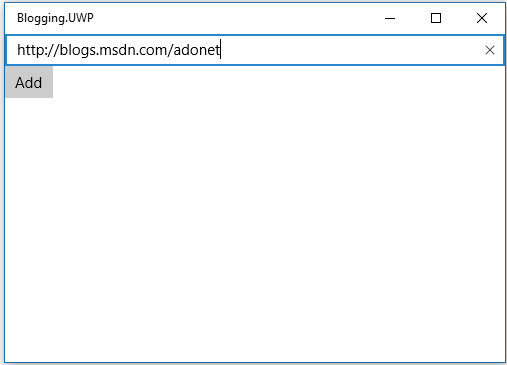 You now have a simple UWP app running Entity Framework Core. For compatibility and performance information that you should know when using EF Core with UWP, see .NET implementations supported by EF Core. Check out other articles in this documentation to learn more about Entity Framework Core features.